Deep beneath Tokyo there exists a boundary between this world and the next: the land of the dead-and the mysterious young man Seiya is its guide. In this collection of bone-chilling shorts, follow the twisted tales of death and hauntings that inhabit this horrifying underworld, where innocent youth fall victim to the ghosts who lurk in Tokyo's underground. Dark Metro had two volumes published in English by Tokyopop, on January 31 and August 5, 2008, respectively, and later digitally in 2014. 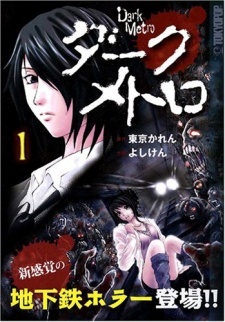 Dark Metro is a horror manga placed in a metro, where spirits with grudges haunt people. The story isn't bad, a haunted metro and people falling victims to the ghosts, while Seiya does his best to save them. The problem with the story is (besides generic horror plot) that there isn't much of it at all, it's a clump of couple of people's fates and the timeline moves too fast, all you can see is action that characters are overreacting, screaming or running for their lives, nothing more. The art is okay, there aren't many details but metro and gore part are done very well. There are too many characters, each one but Seiya didn't get much time at all and all we could see was very short backstory, while the rest was running away from the ghosts, Seiya comes, does his thing and the story moves to the next characters. Despite that, most of the characters were overreacting all the time, behaving violently and bringing others into danger, which made them much more annoying. Seiya is the only character who is in all the chapters, though he seems more like "deus ex machina" than a real person, there is barely any his character development because he mostly appears in time of danger and disappears afterwards. Even though this is mediocre manga at it's best, it's not bad and has enjoyable parts. Many elements are generic - flow of people who get into trouble, an all-mighty protagonist who saves others from evil, haunted place and ghosts. Dark Metro is your standard horror manga. It's episodic so far and uses basic set ups. At the beginning it's fun and fairly well executed. I wouldn't call it the best in its genre but it's far from the worst. Especially considering that it's collections of short stories and not a long and involved plot. Unfortunately it goes down hill from there when it gets to volume two. The stories become a bit shorter and have less plot to them. Plot ideas that could be interesting if there was more buildup and detail fall flat when shrunk to only a few pages. The main repeating character starts out in the first volume as mysterious but not entirely unreal. By the time you get to the end of the second volume however he seems like a badly fleshed out mary sue. None of his powers are explained or even witnessed outside of him showing up at the end of each chapter to defeat the bad guy and make it so nothing actually happened in the chapter. Overall this series is a collection of decent ideas that haven't been worked with at all, combined with a bunch of really generic ideas that haven't been fleshed out either. is there a vol. 3 to this?